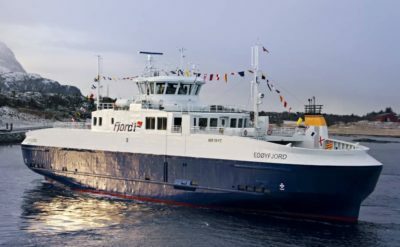 One of Norway’s major ferry firms, Fjord1, claims that one of its vessels was nearly rammed by one of the Norwegian Navy’s corvettes at high speed last November. Fjord1 has objected to how Navy officials allegedly downplayed the incident afterwards. Fjord1 has sent a report to the Norwegian Maritime Authority (Sjøfartsdirektoratet), claiming that the “near-miss” endangered lives and could have resulted in “great material damage.” State broadcaster NRK reported Tuesday that it occurred near Smøla in Nordmøre on November 2, just six days before the Navy was involved in another serious accident at sea when its frigate KNM Helge Ingstad collided with a fully laden tanker while returning to Bergen just after NATO’s huge military exercise Trident Juncture ended. 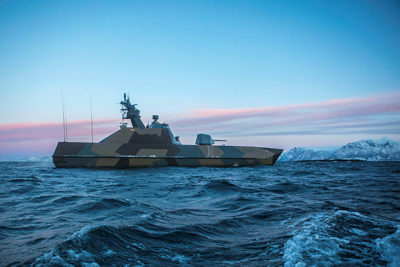 NRK reported that the crew on board Fjord1’s ferry MF Edøyfjord had 25 passengers on board when it spotted the coastal corvette KNM Steil heading straight for it at a speed of around 20 knots. The ferry’s crew sounded a full collision alarm. The collision was narrowly avoided after a quick maneuver by the corvette, which passed the ferry by less than 30 meters, according to Fjord1’s report to the maritime authorities. When NRK initially reported on the incident in January, the Navy offered a completely different account. Naval officials presented a GPS-based map that it claims put the distance between the two vessels at 150 meters when they passed one another. Now Fjord1 has sent radar pictures from the ferry’s maritime chart machine, which it claims strengthens its version of events. The Navy continues to claim its crew reduced the speed of the corvette about two minutes before it would have crashed into the ferry. The ferry firm claimed in its report that neither the corvette’s speed nor course changed until just 21 seconds before a collision would have occurred. Deon Mortensen, safety director at Fjord1, does not, however, want to get into a public debate with the Navy over the incident and told NRK on Tuesday that it was “finished with this case.” He wouldn’t comment on the Navy’s claims, why the company sent new information to the maritime authorities or what they believe the new radar pictures show.